MANILA, PHILIPPINES – When Teresita Rapier left her house for the local market on Saturday morning, she thought it would be just another routine grocery trip. Little did she realize, that by day’s end, she would be hailed a hero by her friends and neighbors. It all began as Rapier stumbled upon a wild water buffalo terrorizing the neighborhood children. Rather than turn tail and flee as she saw everyone else doing, the tiny Filipina chose to take the king-sized beast head-on. Eye witness accounts of the incident vary greatly, but most onlookers agree that the water buffalo was clearly outmatched. 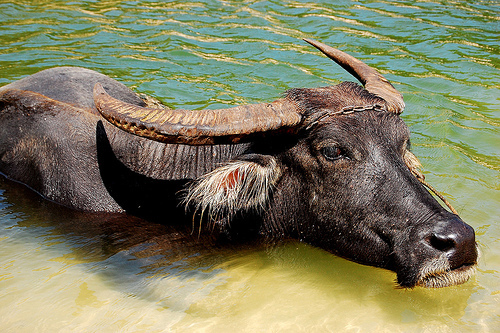 Filipino police managed to sedate the water buffalo and it was later returned to its native habitat, none the worse for its mid-day duel with the feisty Filipina.